I won this on First Reads! Yay! Anyway, my first impression of the book was that it looked much longer than it actually was. This was due to the ridiculously large type size used. I had a flash back to high school when I used to by all my books at the discount books store, and I always forgot to actually look inside the book before taking it home and DAMNIT ANOTHER LARGE PRINT BOOK UGH. But that is just my pet peeve. I thought it was a solid first…novella? Short story? It reads like a novelization of a TV episode, some kind of alternate Firefly space-opera-y type show. Which, now that I did some snooping around, is what the author was going for! So good job! For me, it was a bit too short and simplistic. I loved Firefly as much as the next gal, but what I like in TV is not what I like in novels. I want my novels long and meaty and convoluted, and this was not that. It is definitely a matter of personal taste though, others who enjoy shorter fiction may enjoy this more. Plus the author said he was planning more stories that have a larger thread running through them, and I might be into that.A few specific criticisms: 1) I didn't get a huge sense of the captain’s character? Like I get that the rest of the crew likes him and respects him and he had couple stern-yet-witty lines, but other than that he just kinda seemed like he was there in the background, and felt less fleshed out than the other characters. Not in like a mysterious way, more just in a huh, this guy kinda didn't do much way. Also the doctor is weird? I kinda thought he was a cyborg or something at first, has a very odd way of talking. 2) There are only like 6 characters in the book, and in the span of 20 pages, I think 4 of them told me how difficult/impressive it was to break a ground lock. I got it. New dude is awesome and pulled a solid for the team, I don’t need reminding 5 pages later. (I don't know why this annoyed me so much, but it did) 3) There was a bit too much high-fiving once the mission was accomplished. Again, I don't need 4 scenes where the crew pats themselves on the back for being such a tight-knit crew. 4) Some of the banter seemed forced/awkward. It was trying too hard to be funny every line, and for whatever reason it didn't really gel for me. I think this has promise, and would be interested when more of the overall story is completed. 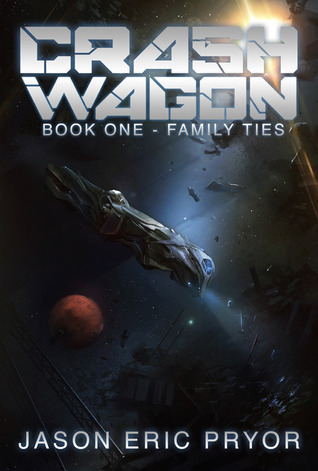 I found Crash Wagon to be a fun little read, primarily due to my love of Firefly. The novel draws from some Firefly elements without being too obvious about it and makes for a short yet fun escape into the Scifi Western genre. The characters could have been more fleshed out, but the length of the story didn't really allow too much more than what we got. All in all, I recommend it as a fun get-away read. Fairly standard plotline, with a somewhat old-fashioned feel to it, more action-oriented in a SF setting than hard sci-fi, which is fine with me. I really don't CARE how things work, just that they work.Good characterization with an interesting cast and a good translation of 'search and rescue' into a space framework. My only criticism would be that the ending felt a bit rushed, but overall the storyline worked well for me. This was a great read! There is a twist in it that I didn't expect, but it worked itself out nicely. I generally like any story that involves ships, space, and especially those that explore the criminal element and its interactions. I also enjoyued the humourous elements as well as the action aspect to it. Like most things I have been reading, I enjoyed the length. It was a guilty pleasure to sink down into my recliner and read it. My first comment is that this was simply too short. I enjoyed this novella and wished that it was longer. I think this author is talented and writes an interesting story. I would like to read more in this series but $2.99 for another 60 pages or so long novella is just too steep for an indie author. GoodIt is a good book, but for me just a little confusing. The characters seem a little strained. Mind you the story has potential and I hope the next book fires up the tempo a little. Short read. Lots of action. Fans of Firefly will like this book. Looking forward to reading the next installment. An easy readA start storyline ,will not put you to sleep. keeps you in the mood to read more. The mystery is just starting.